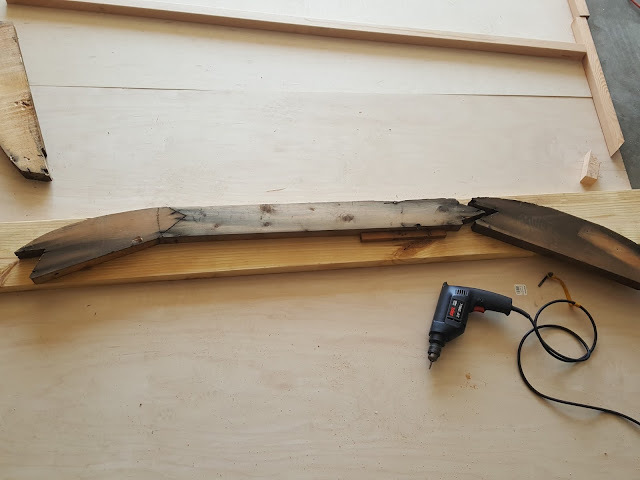 A place to archive the reconstruction of our 1966 Cree RV. A Little of This and That Things slowed down for a while with the approach of Thanksgiving and Christmas holidays. We typically travel quite a bit to see family and friends this time of year, so work periods have been fewer and farther in between. We did frame up the interior wall of the bathroom. This is at the far rear of the trailer. 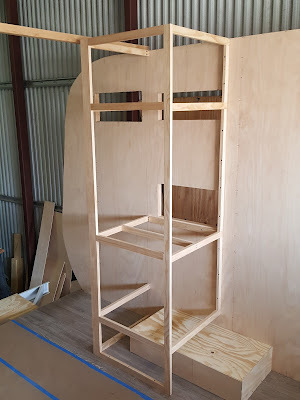 This is the last piece we need to build before we can "button up" the back of the trailer. Once that is done and we put the roof on, we can then get an accurate measure around the circumference of a side wall. This is a key dimension that Hemet Valley RV needs from us before we can order sheet metal. Into the Closet Next in line after the galley cabinet is the closet/refrigerator cabinet. We're planning on a 3.5 cubic foot fridge that will be mounted in the closet. Again, taking into account our relative height; we placed the fridge at a convenient height. The closet and galley cabinets are interconnected; so we could not do the final install of the galley until we got this closet done. Connecting it all Together... Once we were reasonably happy (when is it ever perfect?) we connected everything together. Here's what it looks like from the front of the camper looking towards the rear. 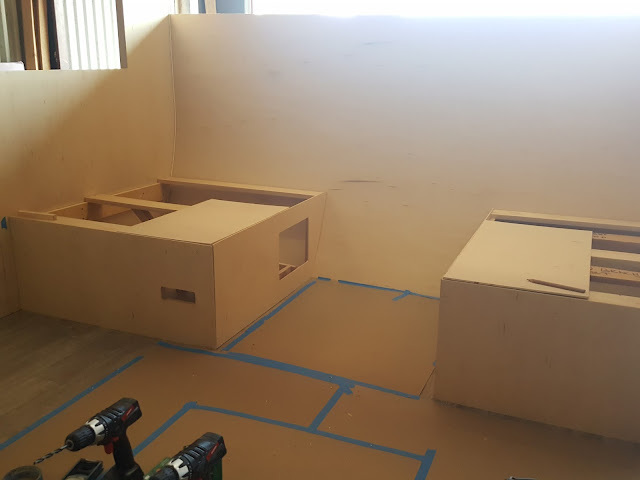 With the dinette benches in place, we proceeded with install/anchoring of the galley cabinets. Here's a few shots of the install. Also, we checked and double checked the fit for the 6-gallon hot water heater and the 15-gallon fresh water tank. Oh...and the water pump that will be located in the cabinet too. We're cramming as much in here as possible to have room for storage of other items under the dinette benches and in cabinets. The cardboard box is a mock-up of the size of the 15-gallon water tank. We wanted to be sure that if we had to remove the tank in the future, we could get to it by taking out the microwave, lifting out the shelf for the microwave, and accessing the tank from there. It looks like the plan will work. Instead of 5 drawers, we'll have 4. 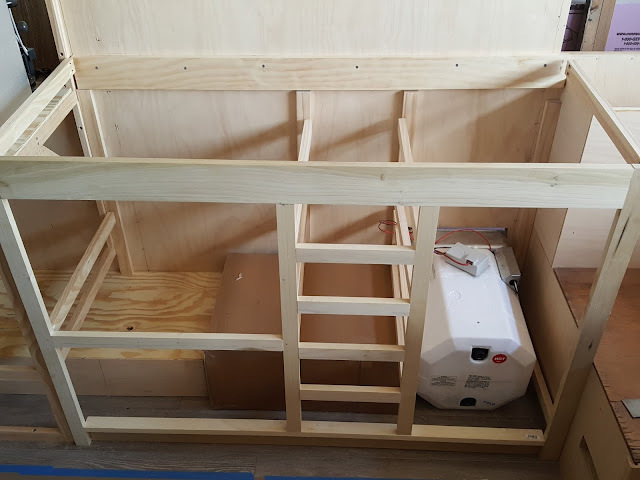 The lower drawer will be false front, since the water tank will be in the way. 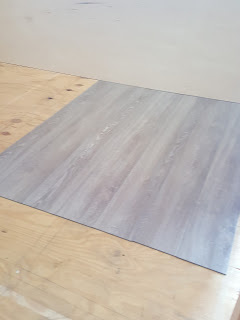 Realizing that the dinette benches and the galley cabinets would require soffits to be placed on the walls...and further realizing that the thickness of the floor covering would dictate where these soffits needed to be placed...we set about selecting flooring. Galley Considerations In the original camper, the cooktop was located on the right side of the galley (towards the front of the camper). This put it right next to the dinette. We looked at this arrangement and decided we weren't comfortable with fire, frying pans, and the potential for hot water and splattering grease to be next to a bench where kids might be sitting. So, we decided to rearrange the galley. SinkThree-burner gas stoveBuilt-in convection microwaveHot water heater (under sink)15 gallon water tankMicrowave Regarding the microwave; we visited an airstream dealer and saw a built-in convection unit. 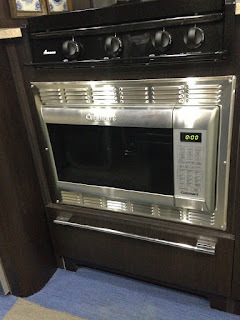 It was a essentially a Cuisinart counter top model, with a custom stainless steel vent/surround. See the picture of the set up in an Airstream (to the right). First in Line: The Dinette The first thing after the front wall, is the dinette. Following on the (relative) success of copying the old walls, we began re-manufacturing the dinette benches. We pretty much copied the old design exactly. 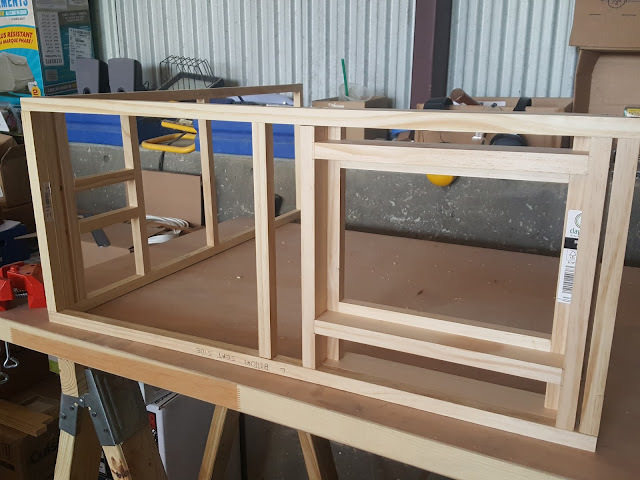 The frame members were primarily 1" x 1" dowels. Modifications We did modify the street-side dinette to accommodate a combination propane/carbon dioxide leak detector, and also the power-center for the camper. Did a little extra work to "counter-sink" the power center so that hopefully it does not get kicked by heels of folks sitting at the dinette (think 5 to 12 year olds that can't stop fidgeting). Raising the Walls & Adding Front Panel Having learned a thing or two with the first wall, I constructed the second one a little quicker than the first, and adopted a slightly different technique. 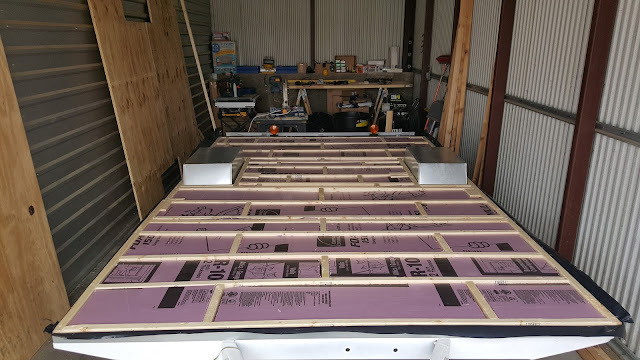 After that, I conned a friend into helping me lift the walls onto the trailer, brace them, and attach them to the floor and trailer frame. I again used anchor bolts that passed through the floor and in some places the trailer frame as well. Front Panel The layout of just about everything in the trailer is based off of the front wall; so we put the front panel on to act as a datum. This was pretty exciting because the trailer really started to look like something. Old Benches - New Wall Just for fun, I brought the old benches from the dinette from our house (I needed them anyway to begin copying them). I placed them in the trailer against the front wall to see how close we came to matching the old curvature. They matched up perfectly! Sa-weet! Building The Walls Using the old walls as a template, we began laying out the new walls. We decided to make the new trailer about 3" taller than the old once, since I'm 6'3" tall. This was pretty straightforward *EXCEPT* for the curvature at the back of the trailer. 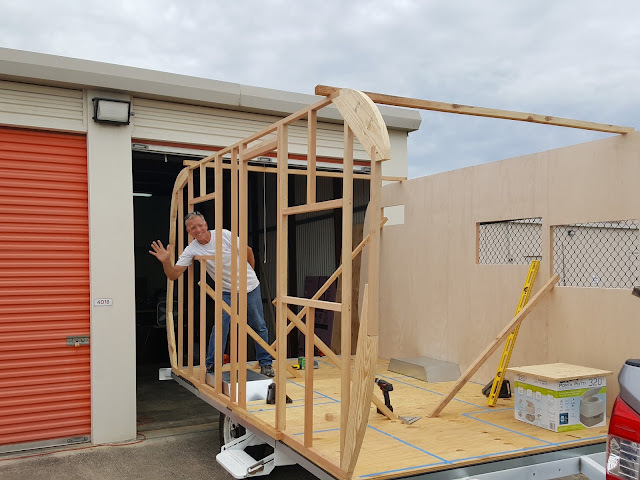 The front of the trailer was easy, because we simply elongated a vertical piece. 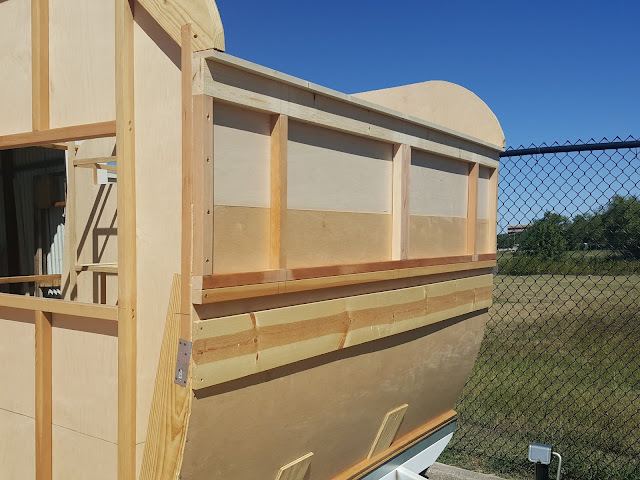 But the back of the trailer didn't have a vertical surface, so we had to elongate the curvature. Layout Here I've fastened the original lumber to a new 2" x 8" piece of lumber. In this picture, I've separated the last joint a little to account for the taller trailer. This is how I "stretched" the curvature on the back of the trailer. Old School We had to cast about for a while before finding a sheet metal shop that was willing to work with us on what we needed. We had a few false-starts...and then the clouds parted, the sun came out, and birds began to sing. 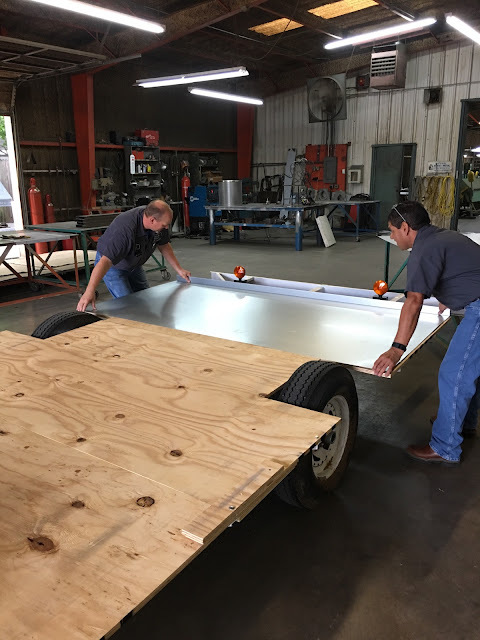 We found: Star Sheet Metal in Irving, Texas. More importantly; we found Henry Cordova...the shop foreman. Henry is a cool cat...and was in to our project.